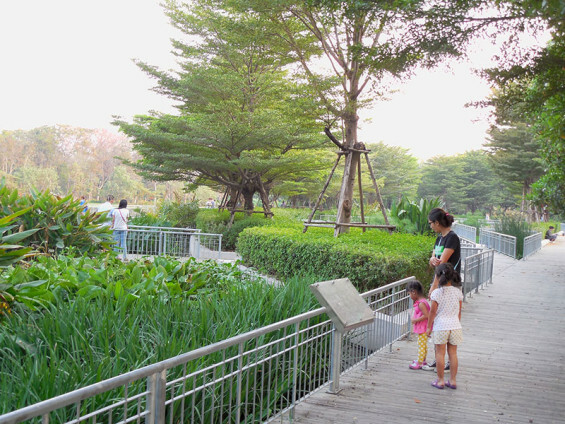 The Bang Sue Environmental Education and Conservation Center (EECC) project was developed on the northwest reservoir of Vachirabenjatas Park or the Railway Park’s (SUAN ROD FAI) boundary. 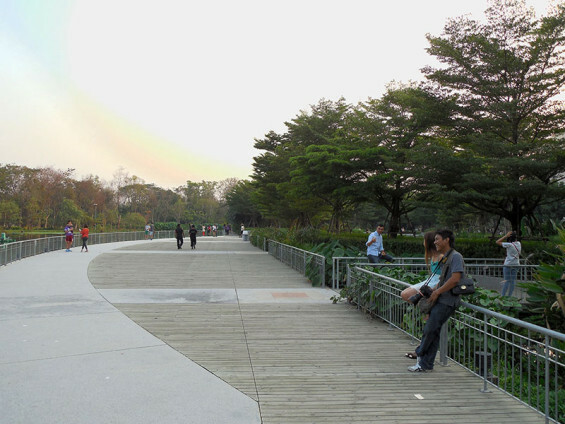 The circulation path within the compound had been designed to maintain the existing main routes such as bicycle lanes, walkways, and jogging route, and connect to the Park’s circulation system. The project was designed to be in harmony with the existing environment. The main building is designed as a 2-storey with an Underground Waste-Water Treatmentplant (WWTP) facility ( with 10x100x150 m. size). 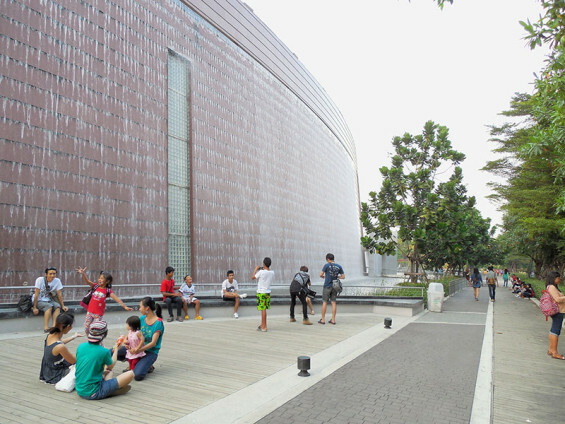 The building consists of two sides; a curvaceous waterfall-facade facing the park and an office-like side facing the Kampaeng Phet 2 Road and elevated express way. 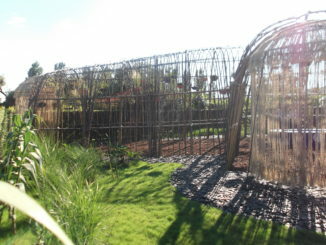 The EECC project is housed an environmental education, especially AQUATIC PLANTS and Ecology Conservation Center, which aim to educate and raise visitors’ awareness on the importance of environment resources. 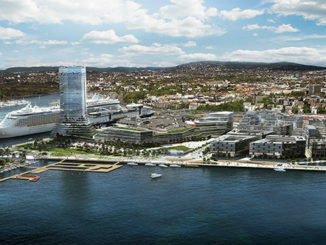 Not only in conserving aspect, but also integrating and promoting the lively urban environments. 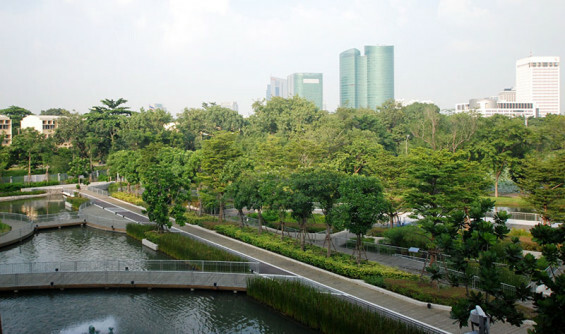 The facade of the building facing the park will be highlighted by a 100-meter-long strip of waterfall, which utilize recycled water treated by an advanced treatment process from the underground WWTP. 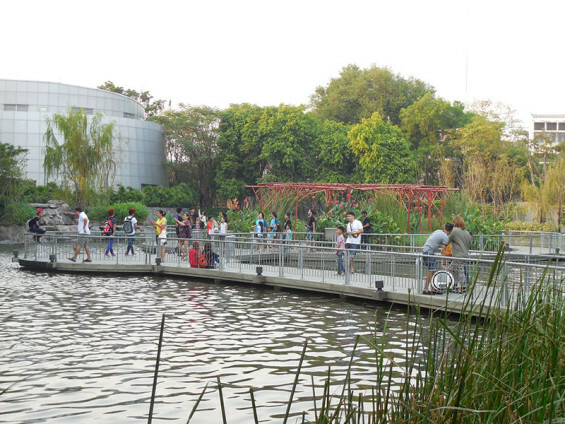 The main Landscaped area, constructed and floating–look on existing reservoir is an educational AQUATIC PLANTS study center as an open water garden which display water plants according to their habitats and botanical grouping. 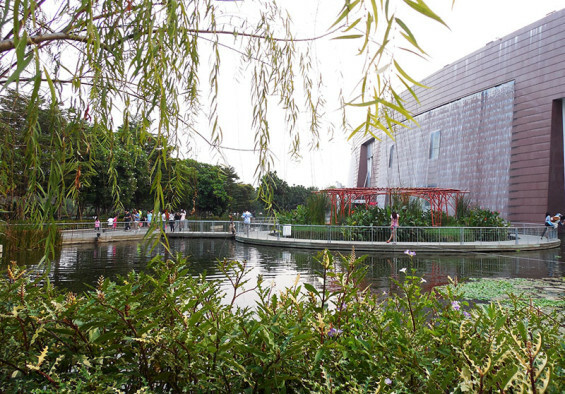 Intimate spaces for multifarious aquatic plants are provided and highlighted by special area of the Royal projects case study. 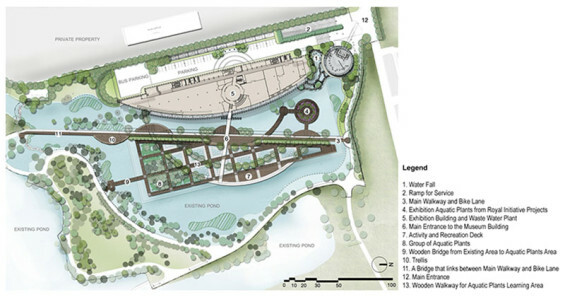 This garden will also provide spaces for environmental activities or outdoor retreat and recreation spaces, concerts highlighted with an unique surrounding. 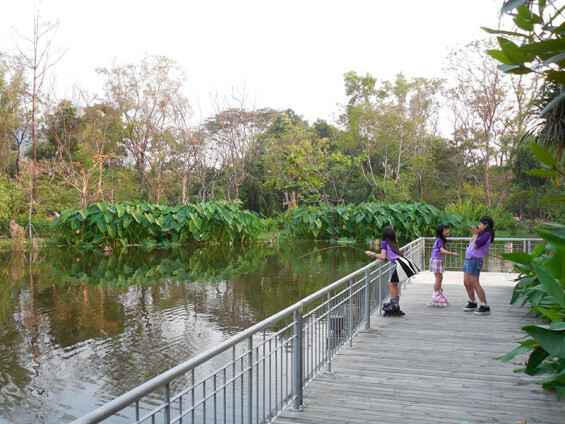 All visitors could move , learn and be entertained along the landscaped areas on the floating wooden boardwalks. 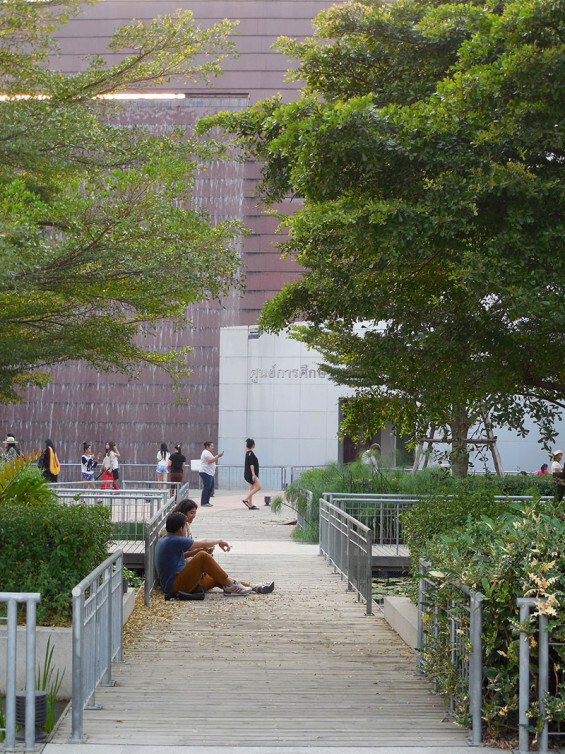 All landscape functions, features and elements were inspired designed, in the ripple pattern, to blend the technology and existing lush urban environment with human demands and use. This project is considered as a first pilot project in South East Asia for the sub-merged WWTP project and also shall be the prototype of designed project which well combined and integrated the needs of Human Urban communities and Ecology environment. and it was awarded by Thai Association of Landscape Architects(TALA) as an Honor Award: General Design-Institution for year 2015. 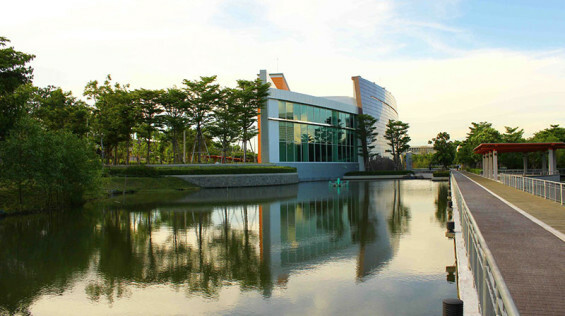 Landscape Architect | Group Three Design Co., Ltd.